This week, we featured healthy apricot recipes recipes for the in-season fruit, to help prepare your taste buds for spring. 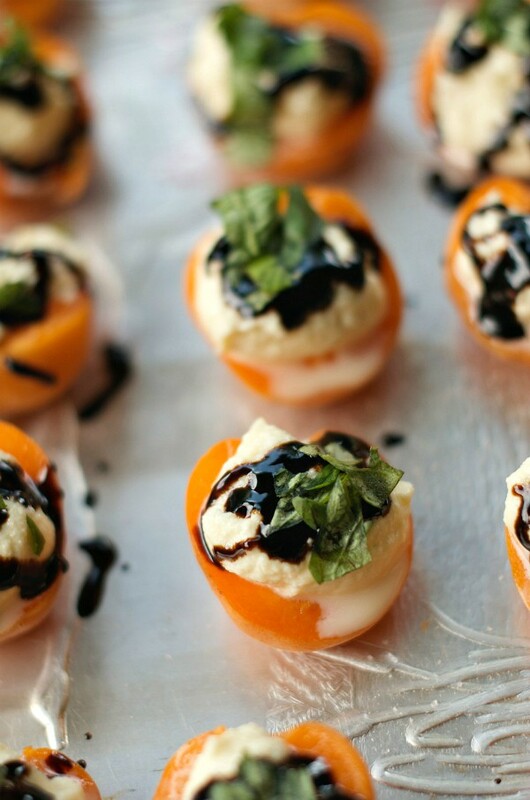 These Apricot Ricotta Honey Basil Bites are perfect for a dinner party. This Apricot-Raisin Chutney is a perfect topping for your next pork chop dinner. Make this easy Honey Apricot Frozen Yogurt for a simple but delicious dessert. This Skinny, Dreamy, Apricot Chicken can be made with fresh or dried apricots. This Blackberry Apricot Salad will help you get ready for summer meals. Flourless Apricot Upside-Down Cake is a healthy treat your family will love. These Roasted Apricots with Ricotta and Honey are a tasty, rustic dessert. You can reduce your risk of heart disease and lower your blood pressure and cholesterol with 2 easy lifestyle changes: healthy eating and exercise. Healthy eating habits can help you lower 3 of the major risk factors for heart attacks, high blood pressure, high blood cholesterol, and obesity. Eat a variety of fruits, veggies, grains, and dairy, which are all good for you in the right portions, and they keep your diet from getting boring. Use MyPlate to learn more about healthy eating and portions of these foods. If you keep track of the calories you take in and burn, you can balance them to keep a healthy weight. Avoid foods that are high in calories and low in nutrition, like soda and candy. Limit the foods high in saturated fat and cholesterol that you eat, like full-fat dairy, vegetable oil, and egg yolks. Use smaller plates, which has been shown to help people eat smaller portions. Don’t deny yourself the foods you love, just enjoy them in moderation. Don’t eat more than 2,400 milligrams of salt a day. The amount of soda Americans drink has risen 135% over the last 30 years. A study from the American Heart Association found middle aged people who drink as little as one soda a day, diet or regular, are at least 40% more likely to develop risk factors for heart disease. This could be because people who drink sodas are more likely to have a sweet-tooth and eat other sugary food. Cutting down on soda both lowers the sugar, empty calories, and salt you’re taking in. Stick to water instead. Trans fats hide in a lot of prepackaged foods. Like saturated fats, they raise your bad cholesterol and lower your good cholesterol levels, increasing your chances of heart disease. Margarine: Choose margarine in a tub, which has the least trans and saturated fats. Baking Mixes: These can have fat in them that you don’t know about. Baking from scratch can help you cut back and control what’s in your treats. Soups: Both dried and canned soups have trans fats and lots of sodium. Try making your own with fresh veggies and meat. Fast Food: Almost everything in the drive-thru has something bad for you in it. Order grilled chicken and skip the fries. Frozen Foods: Even if it says low fat, it can still have trans fat. Choose frozen foods with the fewest grams of total fat. Chips and Crackers: Go for baked chips, low-fat crackers, or fat-free alternatives like pretzels. Breakfast Foods: Choose cereals that have no fat, and breakfast and granola bars that are low in fat. Toppings, Dips, and Condiments: Wherever you can, sub a low-fat alternative, like oil and vinegar instead of a ranch dressing and low-fat milk instead of cream. Drinking a lot of alcohol on a regular basis can affect your blood pressure and cholesterol. While a little alcohol every day, like a glass of red wine, may have some minor health benefits, heavy drinking can cause a number of health problems. Heavy drinking can raise your blood pressure and increase your risk of stroke and heart disease. Alcohol keeps the liver from making hormones that help control blood pressure. Heavy drinkers can lower their systolic blood pressure by 2 to 4 points just by cutting back. Some studies do show that moderate drinking is linked to good cholesterol levels. Stick to no more than 2 drinks daily for men younger than 65, and one for women or anyone over the age of 65. You don’t have to give up your favorite beverages, just drink them in moderation. Never go to a party hungry. Before you leave, eat a light snack full of fiber and protein so you don’t binge at the dessert table. Prepare a healthy side. Substitute skim milk or egg whites in recipes to lower fat, cholesterol, and calories. Survey the spread. Before choosing what to eat, check what’s available. Look for apps with fresh veggies, fruits, and whole grains. Avoid dishes like casseroles where you can’t tell what all’s inside. Eat lean. There are plenty of ways to add flavor without the gravy. Grilled, steamed, skinless, and seasoned are the best heart-smart choices. Don’t stay close by. Take a few items, and walk away from the food. When you’re catching up, it’s easy to lose track of how much you’ve eaten. Stay active. Instead of giving into an after-meal doze, take a walk or go to the mall for some window shopping. By getting rid of extra salt through urine. By relaxing blood vessel walls, which lets blood flow more easily. One article in the Journal of Clinical Hypertension found that just changing how much potassium and magnesium you eat could lower your blood pressure 2 to 6 points. Adding potassium to your diet doesn’t mean you can eat all the salt you want. But getting enough potassium, at least 4,700 milligrams a day, plays an important part in your overall healthy eating plan to control your blood pressure. Studies also show a link between potassium and lower stroke risk, so getting more of it is good for your family members, too, even if they don’t have high blood pressure. Mother Nature’s near-perfect snack is tree nuts. They’re one of the healthiest and easiest snack foods. From boosting memory and brain power to protecting against cancer, research has shown the power of this snack. Studies find walnuts have the most antioxidants, about twice that of other nuts, and polyunsaturated fats, that help reduce cholesterol and protect the heart, omega-3s, melatonin, and protein. If walnuts aren’t your first choice, munching on other kinds still has plenty of benefits. Nuts actually lower levels bad cholesterol in your blood. Try substituting a serving of nuts for a food that’s high in saturated fat, like red meat, eggs, and whole-fat dairy. Packed with protein, fiber, calcium, and iron. Very high in monosaturated fat, or the heart healthy fat. One of the best sources of Vitamin E, which protects against cancer and stroke. Per 1 ounce serving: 160 calories, 14 grams of fat. Good source of monosaturated fat. Per 1 ounce serving: 155 calories, 12 grams of fat. High in monosaturated fat (almost as much as almonds). Per 1 ounce serving: 160 calories, 13 grams of fat. Has more protein than tree nuts. Per 1 ounce serving: 170 calories, 14 grams of fat. Great choice for fighting high cholesterol because they’re low in saturated fat. Per 1 ounce serving: 200 calories, 20 grams of fat. Being active is one of the most important things you can do to help control your blood pressure and lower your cholesterol, as well as lower your risk of heart disease. It doesn’t have to take much time, in fact, you can easily add the recommended 30 minutes of physical activity a day simply by changing your routine. Taking a 10-15 minute walk during your lunch break. Jumping rope for 15 minutes. Gardening or raking leaves for 30 minutes. Going for a walk in the park with your family. Make sure you talk to your doctor before you start a new diet or exercise routine.